Calling all puzzlers! 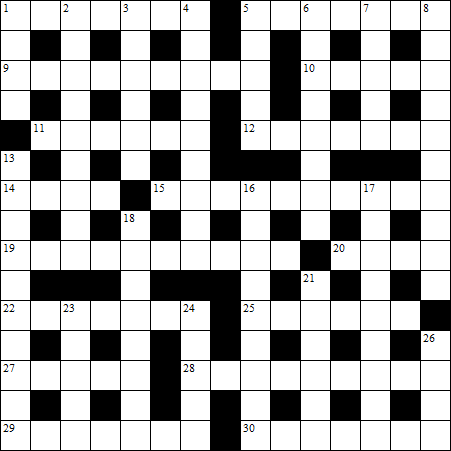 I've made my very own cryptic crossword, especially for you! Good luck, have fun, and happy solving. Really enjoyed this thanks, some great clues. My answers take the form of 'ANSWER - definition, explanation of wordplay' with stuff in square brackets containing extra comments. Great puzzle! Particularly loved 18D, which seems so obvious in retrospect that I'm surprised I've never seen it in a cryptic before. And 24D is very well clued! A note re: 7D and 21D: some people consider indirect anagrams (an anagram of a synonym) to be bad form in cryptics. Not a big deal to me, esp. since those clues are pretty straightforward, just mentioning it FYI. BROTHEL (not all of "brother" followed by a bit of "leg"; definitely a lewd locale). TORT ("trot" is a synonym of jog, reversed becomes "tort" which is a crime). OCEAN (an anagram of canoe and synonym of sea). SPEAR (an anagram of parse and a type of weapon). CLEAR ("confusing" suggests anagrams, so we want an anagram of "race" with one extra letter; L is the first letter of "left"). CLAIM (the letter I inside "clam" which is a mollusc; swear is a synonym of claim). Not the answer you're looking for? Browse other questions tagged crosswords cryptic-crosswords or ask your own question.